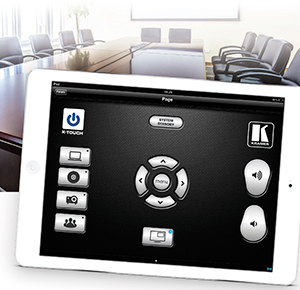 Pro AV vendor Kramer has launched K-Touch 3.0, a cloud-based platform for room control and automation via any Android or iOS device. The system allows integrators to configure control and automation for more than 100 room elements such as lights, screens, sound, HVAC, thermostats and any existing AV system, all controllable from any tablet or mobile touchscreen. Step-by-step wizards and pre-programmed drag-and-drop modules cover a wide variety of media programs and devices commonly used in control and automation environments. Room elements can be controlled via Ethernet, or when the system is used in conjunction with Kramer FC-series format converters or third-party controllers, control can be set up via RS-232, GPIO, relays or IR. The system is also compatible with Kramer RC−series button controllers. Since K-Touch 3.0 is cloud-based, users can collaborate and provide remote support and updates without having to be on site. Kramer offers an online training course for K-Touch 3.0 as well as an online support database that includes tutorials, articles, videos and sample project files. For more information, visit the Kramer site.